The use of an M12 coupler connector at the connection head of a thermometer, rather than a standard cable outlet, enables quick and safe connection. In the hygienic, food and pharmaceutical industries such a design is also being demanded ever more frequently. In practice, plant manufacturers like to rely on pre-assembled cables with fitted connectors, since this completely eliminates having to fix the single strands into the thermometer head. The time required for assembly and for disassembly during calibration or when replacing the instrument can thus be reduced considerably. Another advantage is that, in the event of changing out any instrument, incorrect re-wiring can be avoided. In general, it is also worth noting that, to ensure the operational safety of plants and for their maintenance and servicing, it is imperative that equipment is easy to clean and that moisture protection is at a maximum. These requirements apply for all process components, also outside the process (in the “splash zone”). 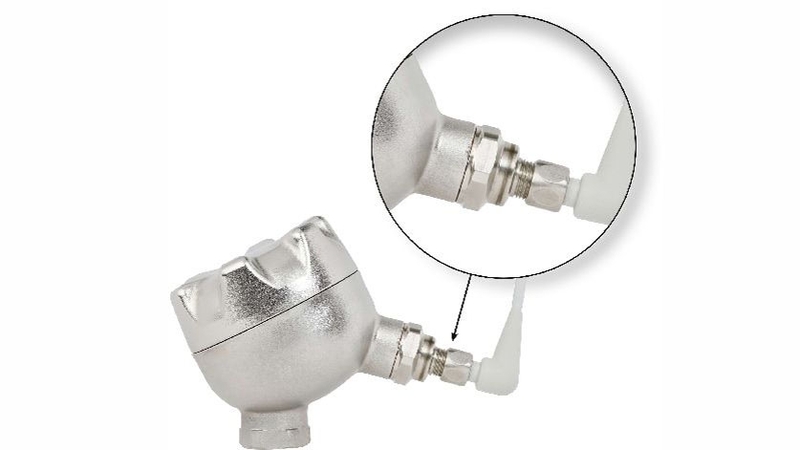 WIKA has adapted the full-metal M12 coupler connector, familiar from the TR21 product line, to the cable outlet for thermometers with connection head and thus enabled a simple and reliable connection with a 4-pin M12 connection cable. The high-quality sealing concept of this connector has also been proven in the extreme requirements of autoclavable sensors. In addition to the already established TR21 miniature resistance thermometer, which was designed for the high IP requirements of sanitary applications, WIKA now also offers thermometer products with connection heads – models TR20, TR22, TR25 – with a hygienic M12 coupler connector for the hygienic, food and pharmaceutical industries.